SGPT: Tell us about yourself. SH: I’m 34 year old Husband and father of two young boys currently living in Tuscaloosa, AL. I own two business, a pipeline construction company and a land development company. I’m a larger guy at 6’3” and 240 lbs. On average I train 4-6 times per week, 1-2 hours per session utilizing all types of Crossfit, weighlifting, running, rucking, stretching, yoga, and what I call oddball-hybrid workouts (basically made up difficult tasks to complete with peers…example, carry/move a RxR cross tie 50-75 yards 10 times back and forth anyway possible, etc). I actively recruit peers and friends to train or train with to try to build their self-confidence by showing them with each other’s help they are capable of doing more than they ever thought they could. Basically your typical social Type-A former jock, Sheep Dog type guy. SH: My entire life has been centered around sports and sporting events. I played baseball and tennis through high school all over the country. Then eventually played baseball on scholarship at the University of Alabama. I was fortunate enough to be in some 50 & 60 win college teams, making it to play in the College World series in 1999 in Omaha, Nebraska. These successful teams taught me and instilled in me the importance of your peers when attempting and sustaining difficult tasks and challenges. This provides the basis of all of my training and influencing to this day. SGPT: How did you train for the Tough Mudder and Spartan Beast? SH: The most important part of my training for each of these events was committing to other peers to do these events together! This established a baseline of commitment to each other and our training. There was NO backing out at that point. Once we were all committed, we then watched YouTube video’s on each event and began tailoring our training to develop the things we thought would be important to not only completing each event, but to execute them effectively. With the Tough Mudder being 11 miles, and the Spartan Beast being 14 miles, obviously running long distances and endurance was very important. And these were distances in mountainous terrain. So frequent 5-10 mile runs (sometimes with weight vest were important. Secondly was developing the ability to easily handle our own body weight and control our bodies. Most of the obstacles on each course are centered around balance, climbing, and agility. This is where Crossfit really helped. Having to handle your body weight in awkward positions, pulling yourself up in 10 different ways, balancing through slippery and muddy conditions, etc. We did lots of pull-ups, push-ups and core exercises. We also made sure we spent at least one day a week doing heavy weightlifting exercises, to maintain strength. We also spent alot time stretching to combat muscle soreness and to help the muscles and joints be more durable. Register for the next Spartan Race with coupon code! View upcoming races. 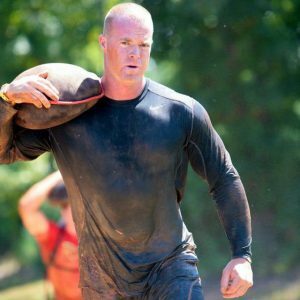 SH: The Tough Mudder (Georgia) is a team based team centered event. It is not timed and is big on finishing and helping your fellow Mudders finish. And that spirit is shown and felt on the course. You will help many others complete tasks and will be helped as many times. It is 10-11 miles and about 25 obstacles. The obstacles vary from wall climbs, ice baths, high monkey bars on steroids, mud runs, crawling in pipes 2/3 full water, to muddy half-pike climbs and electric shock! Something along the way will intimidate you and test you. It was very well organized and stationed to ensure plenty of water, bananas, and electrolytes were available along the course. The Spartan Beast (South Carolina) is exactly what it’s called, a BEAST! It is a race more for the individual to test him/herself in a timed event. It is a 12-14 mile course with about 25-30 obstacles. They are similar to the Tough Mudder obstacles but some are much more difficult. The rope climbs are high, wall walks are long, sand bags get heavy, and there is a 30 burpee penalty for any failed obstacle. And they have people at each obstacle to hold you accountable. Plenty of mud, water, and “you gotta be shitting me” moments! The Spartan was however not as well staffed along the course and not enough watering/carb stations. SGPT: What was the hardest part of each one? SH: Tough Mudder…..for my experience personally was that it was 22 degrees! But the courses tougher moments were climbing Mt Everest (a slick muddy half-pike) and a ½ mile long frozen creek about knee deep you had to run in on the course. Spartan Beast…….for my experience personally was that I tore my calf muscle on the first ½ mile and completed the course injured! But the courses toughest moment by far was on mile 12 there was a 100 yard long mud hill on about a 30 degree slope, they had barb wire 18” off the ground, and steady hammered you with fire hosed water as you belly crawled the entire mud hill. Tough, but in hindsight….AWESOME! SGPT: What is the one thing you wish you would have done to get ready for either? SH: Tough Mudder…..I wish I would have done more cold weather training. Frozen and shivering for 3 hours while completing difficult task was quick learning experience. Know the weather conditions for your event and train accordingly! Spartan Beast…….STRETCH AND WARM UP better! Not properly stretching and warming up before the race led to my calf injury during the first ½ mile. Big mistake! SGPT: What trail shoe did you use for the race? SH: I was wearing a Brooks Adrenaline ASR 12 Running Shoe . It’s was one of their newer trail running shoes at the time. SH: Besides the obvious of endurance through lots of running, and stamina and body control through Crossfit…………DEVELOP YOUR GRIP! Throw away the gloves and get rid of the wrist straps. The amount of use of your hands and grip in these events is very challenging. Add mud and water to it, and try and hold on! Toughen your hands, palms, and wrist. This will help you tremendously! Also, get a really good pair of stable trail running shoes. Don’t attempt with the 5-finger or soft-sole shoes that are popular these days. These shoes have no place in these type events. Shane is a true competitor and a great friend. I had the pleasure to participate in each of these events with him and what began as a dare from Shane has turned out to be an addiction for both of us. I guess like many others, we just enjoy putting ourselves through HELL.